Mesa ETP Vapor Guard® gauge pole ladder cover is an innovative solution to emission reductions in internal floating roof tanks (IFRT). Gauge pole ladder covers greatly reduce hydrocarbons from escaping through slots in slotted gauge poles. 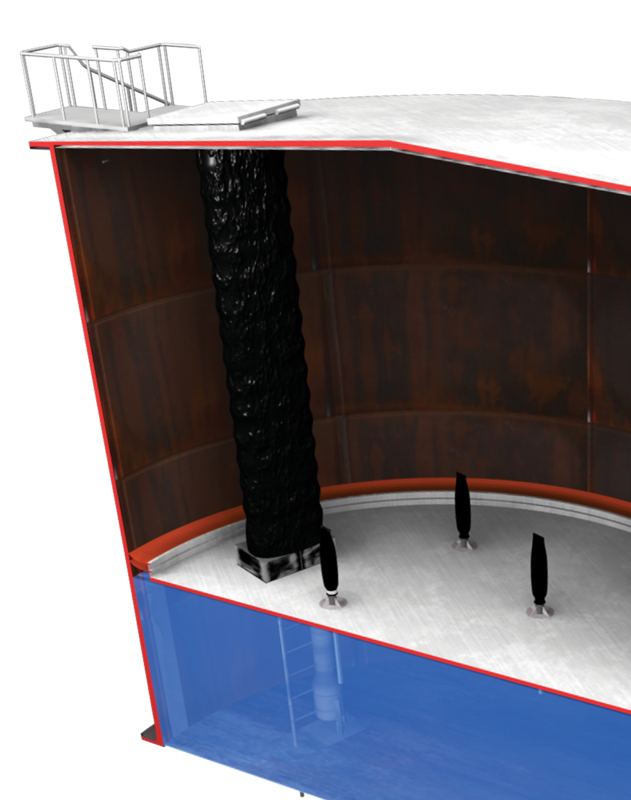 Tank owners benefit by reducing product emissions while meeting environmental regulations. The Mesa ETP gauge pole ladder cover is manufactured using MesaThane© 6036 urethane seal material to form a casing around the slotted gauge pole ladder. (Mesalon© 7010 is available for specialty applications). The optional transition box provides a seal at the ladder negotiator area on top of the floating roof. Significantly reduces product emissions meeting or exceeding environmental regulations. Made with MesaThane 6036 urethane seal material. Allows for the unobstructed use of the interior diameter of the guidepole. Designed to be easily installed, even while tank remains in service. Manufactured per order to ensure effective operation and proper match to size of guidepole and product contents of tank. Field tested, featuring over 10 years of proven performance. All covers are manufactured under ISO 9001:2008 certification. Federal Register (65 FR 19891) specifies the “flexible enclosure system” as a pre-approved technology for the control of emissions from Slotted Gauge Poles. Regulations also state “no readily observable emission pathway” allowed for slotted guidepole. (65 FR 2336). Mesa ETP Gauge Pole Ladder Covers are at the forefront of this technology. For more information regarding Mesa ETP products, fill out the form below and a tank expert will contact you.